"We were born in Allahabad. Allahabad is a middle level town but extremely rich in all kinds of activities... My father came from a very eastern background and my mother was very western. She'd studied in a convent, she had an English nurse to look after her and she came from a very affluent house. There was a lot of difference in their cultures. My father is a Kayast from U.P. My mother is from Punjab, Karachi. She's a Sikh. My father's a writer, a poet, man of letters. A stalwart. My mother, strong in her values, in her beliefs. And therefore, fortunately, I got a lovely blend of both the worlds, the east and west." 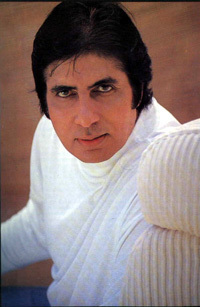 How was Amitabh Bachchan as a child? "I was very shy as a child. Very shy. Lot of problems with very simple things. Like entering a restaurant all by myself. And even much later when I was looking for work in films, I met Manojji and he said, he was shooting in Filmistan, he said come and see me there. And I used to catch a train from Churchgate, go to Andheri, walk from the station up to the Filmistan gate. But I just never had the courage to walk in. And I tried to, for seven days, but every time, I came back from the gate. I'm very shy even today. But I must admit that coming into films, and putting myself into situations which are unreal has, perhaps, given me a little more confidence. But initially it was destroying. It destroyed me completely when I went to Hotel Sun `n' Sand and I saw Manojji doing a song with Sairaji. There were millions of people standing. I was petrified. I remember having sleepless nights. I still do sometimes, when I have to do a song out in the open in front of people. It's not so much the incapability to do the sequence, as the fact that I have to do it when there are millions of eyes watching. I know it's a contra-diction to my earlier interest which is theater. But an introvert, I've always been. I don't know why. I don't know what it was. This is something I'll really have to search myself for, much more deeply. But at the very outset and looking at it very immediately...actually I think I should have been a lot more confident with the kind of upbringing and parents I had. Maybe my father was like that but my mother's always been very bubbly, full of confidence. My father's more shy. Introvert. But very powerful when it came to his expression, his writing. In many respects you could say that temperamentally I'm like my father. Physically, maybe I have the Sikh blood." After you passed out of boarding school, was it difficult for you to obtain a job? "Well, there was a lot of rejection because everywhere I went, I failed to get a job. Because I was either not qualified enough or I was too shy or I was too tongue-tied during my interview and there were more qualified people getting it. Terribly frus-trating time. And then eventually, I just packed my bags and left for Calcutta." How did you think of venturing into the movie business? "After a few years, life in Calcutta became stifling. Something was missing. All along there was a lot of interest towards movies. Specially Hindi movies and having real flights of fancy where you, to a very long shot imagine yourself connected with the world of films. And all your dreams. And then suddenly a desire to actually go and join the industry but still very shy. How does one get in? And then coming across this talent contest and applying for it and again rejection. Not being accepted. Chucking up the job. Getting really desperate. Moving to Delhi, back to the house to see my parents. Gearing yourself up for the final plunge and then, landing up at Bombay. Starting your struggle. Some days exciting, some days not so exciting. Some rejection, some achievements. But always moving. And then what followed after that everyone knows." Do you think actors lead normal lives? "I've always said that actors should be treated very carefully. We need a lot of understanding. There are millions of things that could destroy us. We are broken up people inside. That's why you find a lot of us landing up with the psychiatrists. That's why you find a lot of us behaving very peculiarly and I say, please grant us this peculiarity. Because, this is all that is there to say our own. No, we don't live normal lives...that is why we need to be treated perhaps a little gently. Handled a little more carefully. Understood a lot. Grant us our idiosyncrasies. Grant us our difficult behaviour, obnoxious behaviour, whatever it is. It's not easy to be stable. And if there is somebody who is stable, then he's got have immense power, strength to wrestle with." Your by-now legendary accident on the sets of 'Coolie' was a turning point in your life. Would you like to talk about it? "I hate to talk about the accident. It's like really pushing me into areas that I've put away. It's going to be difficult. See, I never knew that I was going to die. I knew that there was something very wrong with me but I never knew that I was going to die. And the entire period when I was seemingly gone, when I was struggling for life, I was in a state of coma. I was unconscious. That was the difficult period for my family. It was easy for me because I was oblivious. The difficult period for me started after I got okay. When you're told what you've been through. And it's not enough that you've been told. The worst phase is when you discover that what they have told you is, in fact, true. Your entire body is finished from within. You're in full bloom, you're healthy and you're full of life and gusto. And to suddenly find that the body is not there. You can't move your fingers. Your legs can't support you. And your whole system has gone through a battering. But you know that it was there. It was just there the other day. How come it's not working? It was a very frightening time." Were you overwhelmed with the kind of support you got from your fans during that period? "The disturbing element of the accident was the millions of people and their expectations. Their wishes, their prayers and their feelings. And the extent to which people had gone. And you have nothing, absolutely nothing to repay them. You just sit in your bed and you just enjoy the benefit of how the others have prayed. And lots of them who really went through physical penance, when you've actually sat back and enjoyed it. I remember when I came out of the hospital, for many months I could think of nothing else. It still disturbs me that I have been unable to do anything in return. And how does one do it? How do you go and actually thank each one of them? How can you possibly reach all the churches, the temples, the Gurudwaras where prayers were made. Most of them, I'm not even aware of. And to this date, I still meet the odd person whose only reference to me is that I prayed for you when you were sick. And meet this lady, she fasted for you, and meet this kid who didn't eat, this is the temple where we prayed for you. Just fleeting glances of people just coming in and saying things like this. That's your only connection. And millions of others whom you know nothing about. And what do you do? Soon after I started working, I went for a very long schedule in Madras. I remember that it was the first time I had got out of the hospital, come home and then I was alone again. I used to spend miserable nights. I used to call Jaya and I used to ask her, `What do I do? '...Some of my friends, they tell me if we were in your position, we would have committed suicide long time ago. And sometimes I did feel like it...I don't think it's advisable to go into it further...I told you there are a lot of disturbing areas. I'm really marveling at myself at the moment that I have had the strength to talk about it but it's like an addiction, you know. When you start thinking about it, you start talking about it - everytime I talk about it or think about it, something new comes into my mind - something new comes out of it - maybe it will all come out one day. When I'm going through perhaps a psychiatric test or something." What kind of a husband does Mr. Bachchan make? "Jaya is a very spontaneous person. Not at all like me. And it's just very fortunate for me that she's from the same profession as me and so she understands. She was always familiar with the environment I was in. She knows what the film industry is all about, so in fact, it's a boon to have her. I don't know of course what the situation would have been had I married a lady outside my profession. You say that marriages in this industry don't last. But with all due apologies and all due respect to others, how do you put me in the same category? In any marriage, there are ups and downs and areas where disagreements take place but that's all part of it. Jaya is extremely open and very straight. Sometimes embarrassingly straight but that's how her nature is. I've never tried to disturb that quality of hers and she's not disturbed my quality of being to myself. When I want to be left alone, she leaves me alone. It's very similar to the relationship between my parents...You know, when I married Jaya, I was not economically very sound. And now, when I've reached a stage where I can afford to be extravagant, that stage has passed by. But I'm sure that had I not been married to her and had I still had the kind of success that came my way, I would have still not encouraged a situation where expensive gifts, expensive outings were going to be the criterion for my association with a woman. I appreciate a more normal and simple relationship. That is what attracted me to Jaya. She's very simple and very down-to-earth. Away from all this." Do you have any regrets whatsoever? "My greatest regret has been that I could not share the growing up with my children. When they were growing up, I was working from morning to night. When I left, they were asleep, when I came back, they were asleep. In many ways, I envy Jaya who spends more time with them. Of course, these days, thanks to the condition put by the various associations, there is just one shift and I do get back home early. But now the kids are at the boarding. And I miss them. In certain respects, we have probably not been able to give them a very normal upbringing. Specially after I entered politics and the security problem came up. Going to school with six-seven guards holding machine guns is not really the wisest of ideas for a growing child. And I'm sure it must have affected them adversely. Not being able to go to friends' houses without checking out details, without informing the security. Not being able to invite their friends home for various security reasons. Metal detectors, checking out proper-ties and their friends. Even my friends and people who visited me were checked out. They were embarrassed but it couldn't be helped." Why did you venture into politics in the first place when you knew nothing about it? "I know I should have never got into politics. And I've learnt my lesson. No more politics. But the additions and subtractions will continue. And what am I supposed to do? How can I rectify the situation?" Have you ever tried to analyse yourself as a person? "I know that there are a lot of areas inside me which I need to analyse. But I need time. I can't be rushed into it. Even if it keeps lingering in the back of my mind always. I keep joking, fooling around on the sets, trying to push everything away for a later day scrutiny. I don't even want to acknowledge those dark corners of my insides as yet. And if at all I do it, I'll do it for no one else but myself. Not my wife, not my parents. Maybe my children - maybe just my son. Nobody else. Of course, there is also another way of looking at things. Supposing I did not have this pressure of talking to the media, maybe people like you and others would have always thought of me as somebody else. I don't know what opinion of me you have now. I don't know what you felt before you met me, how you felt while you were interviewing me and how you feel today and how you'll feel tomorrow. But I'm sure there will be a difference. Because forming an opinion without meeting a person and judging your instincts and impressions after meeting him are two different things. Most people I've met of late have gone back thinking exactly the contrary of what they thought earlier. I've tried to be as honest as I can with you. I can tell you that I've never spoken like this to anyone before. I wonder if you're convinced. You don't look it. Maybe I will convince you someday."